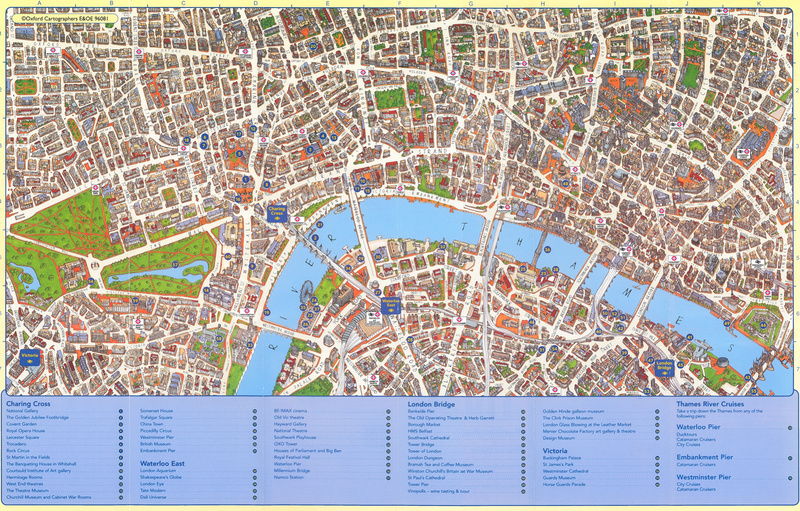 This map, created by illustrator/designer Mike Hall (we previously featured his borough maps) is simply called the “Central London retro style map“. 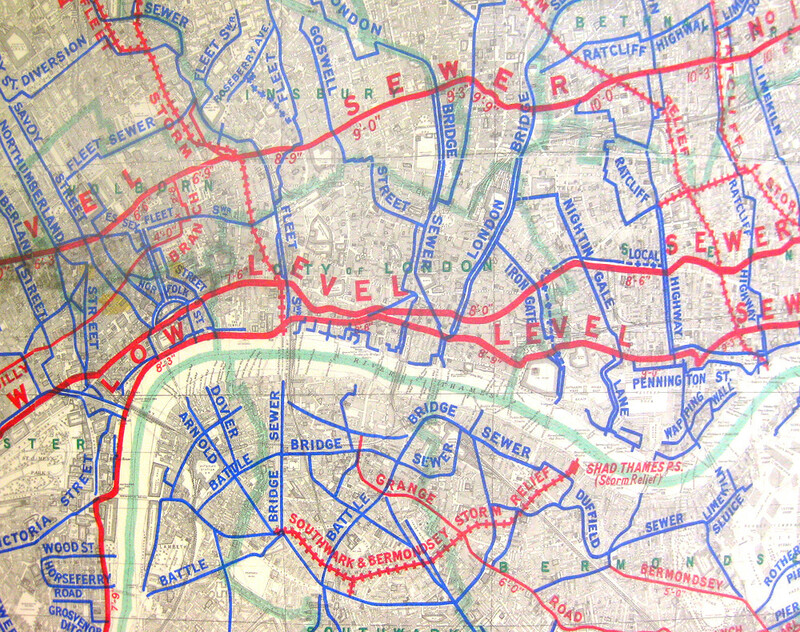 It’s a brand new map, but in the style of designs from the beginning of the last century. 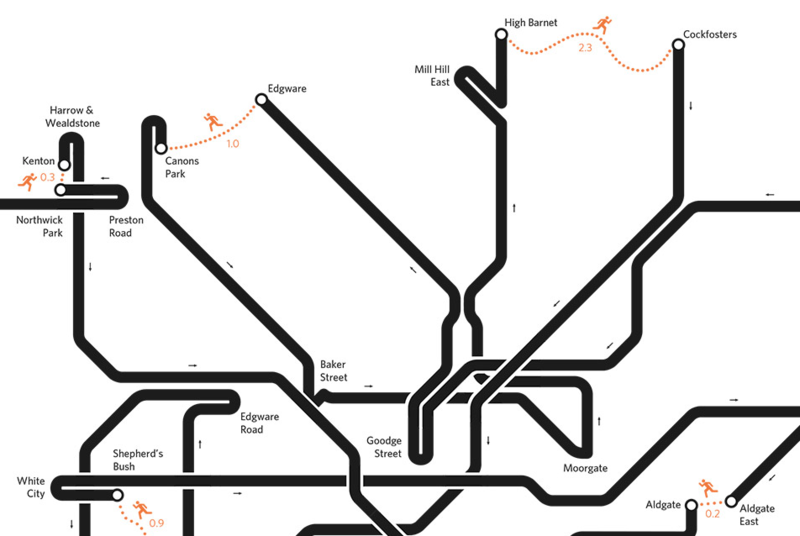 Mike was particularly inspired by the typography and limited colour schemes used in maps back then, and applied the styling to a fully up to date including the latest London landmarks such as The Shard and even the course of Crossrail, an underground railway line that has been dug but is not due to open for another four years – shown, with other underground railways, as subtle dashed lines. 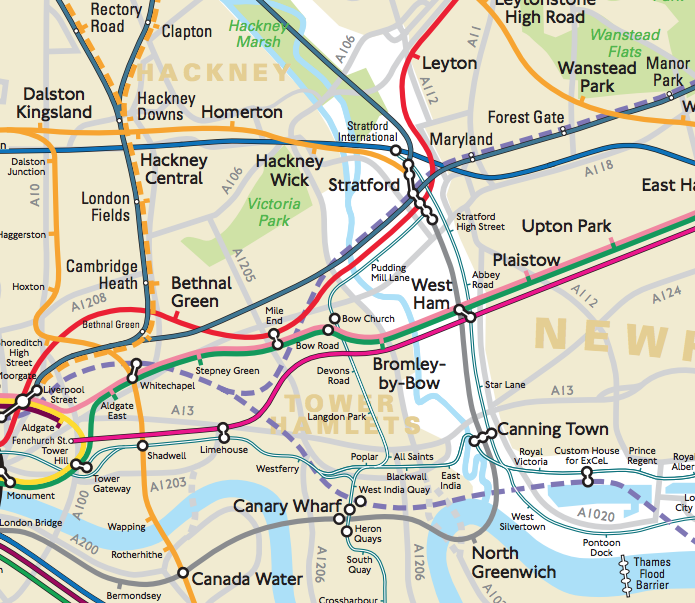 Blackfriars station is correctly shown extended right across the Thames, as it now does following a recent major upgrade. 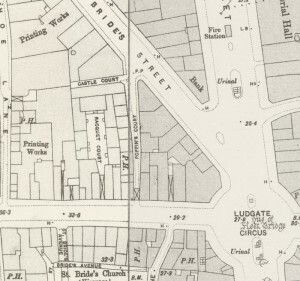 There are lots of nice cartographical details about this map. I particularly like the parallel line effect used to emphasise the edges of water features such as the Thames, and the attractive fonts used carefully for different features. 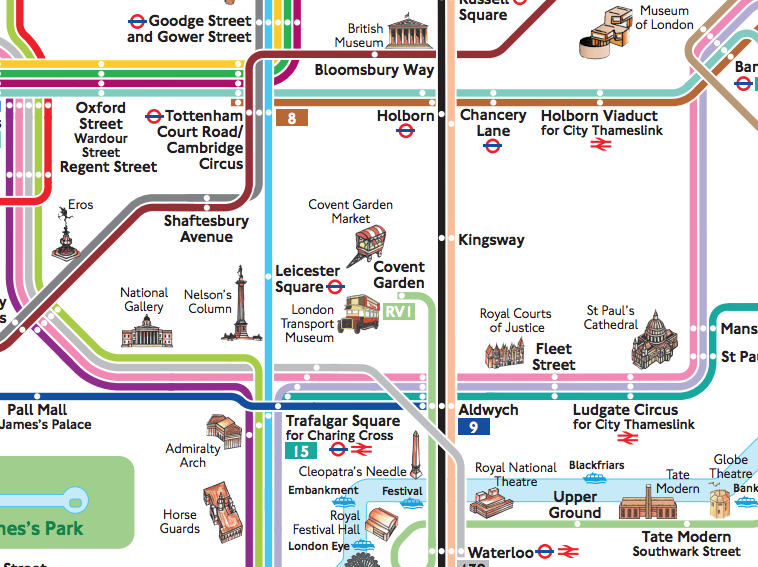 It’s also quite refreshing to see a modern London map which doesn’t use the tube roundel for tube stations – instead, a simple black dot (For smaller stations) and dark grey shape (for larger ones) is used. 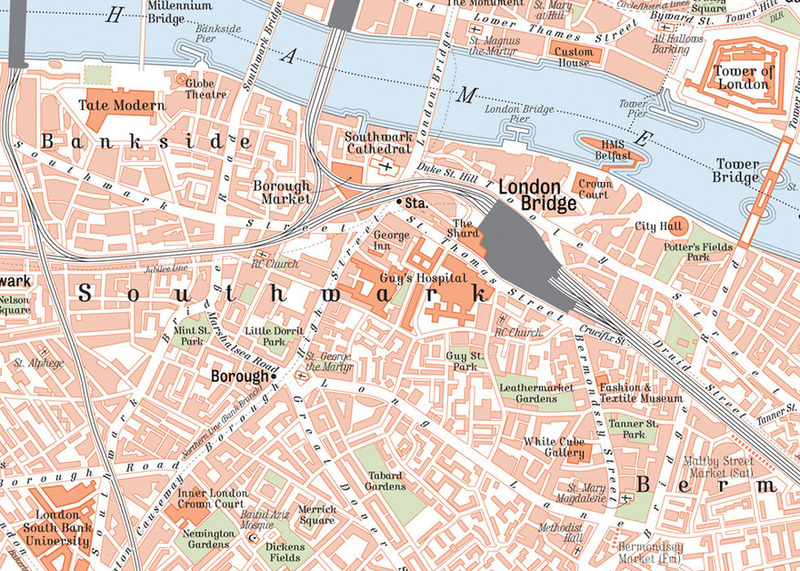 The muted colours (mainly light orange, light green, light blue and dark grey) complement each other well, producing a map which doesn’t overwhelm the senses, while providing enough interest to encourage visual exploration. 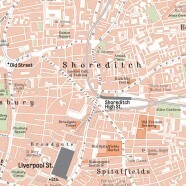 We featured a new map in an old style previously – the Wellington Map harks back to the early 18th century. Mike’s style sits between this overtly old-fashioned look, and the latest auto-generated Google Maps and OpenStreetMap maps that we see on our smartphones and computer screens. 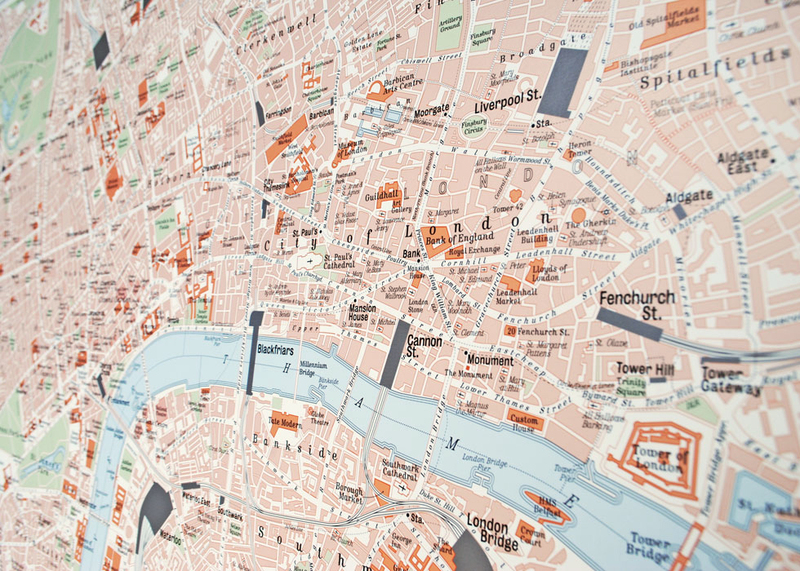 His map provides a “touch of class” and reassures me that there is certainly still a place for classically designed, beautiful, modern maps of London. Mike’s been working on the project for the last six months and has ambitious plans for similar maps of other major European cities – good luck, I look forward to this future output and also more London-focused cartography. You can view more excerpts of the map, and buy one from Mike’s Etsy store, via his webpage. Thanks to Mike for the heads-up! @oobr If you’ve got time, could you recommend something like https://t.co/iMHE7XMXdK by Mike Hall but with slightly larger coverage?